This might be one of my all time favorite salads. It’s healthy, delicious, and relatively easy to make. 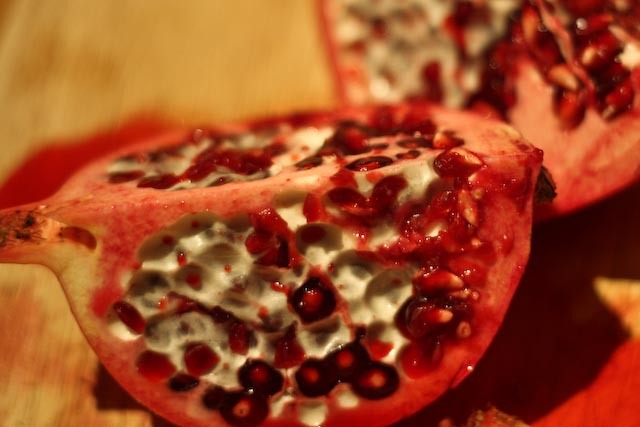 Because I’ve added pomegranate seeds, it does require a little extra legwork; however, you can always buy prepared pomegranate seeds (Whole Foods sells them when in season), or you can substitute dried cranberries, walnuts, or another favorite topping. 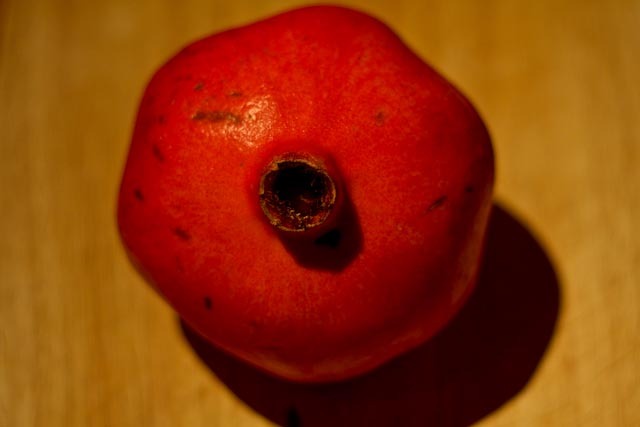 If you’ve got a few extra minutes, preparing a pomegranate yourself can be quite fulfilling, and the seeds are high in nutrients, particularly antioxidants. 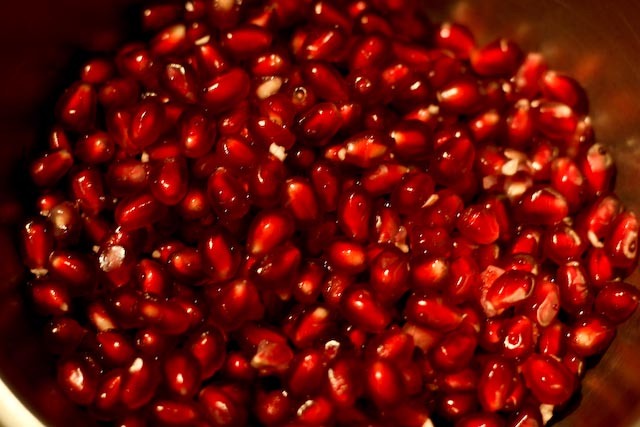 I had never prepared pomegranate seeds before, and (I’ll be honest) I was pretty darn intimidated. Turns out, it’s not as scary as I thought. 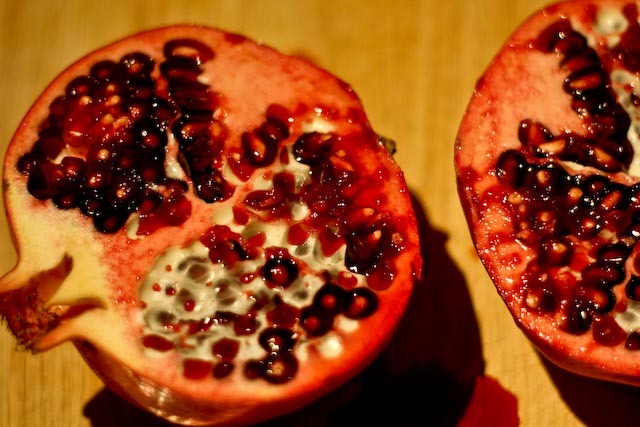 First, I cut the pomegranate in half, and then cut each piece in half again to get quarters that would be more manageable for removing the seeds. I filled a medium size bowl with water and removed the seeds under water to help separate them from the fruit’s membrane. The seeds are more dense and will sink to the bottom of the bowl, whereas the lighter membrane will float on the top and can be skimmed off and discarded. 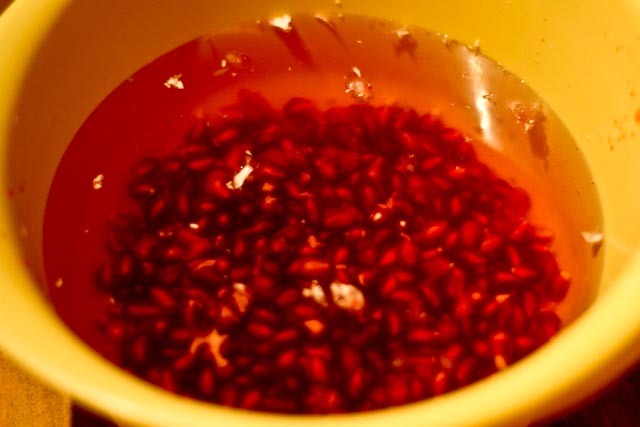 I discarded the membrane and strained the seeds. Ready to use in this salad or any other delicious dish! I roasted bite size pieces of butternut squash and Brussels sprouts with olive oil, salt and pepper. I let the veggies cool a bit before mixing into the salad so as to not wilt the spinach too much. Goat cheese adds a creamy, rich texture, and the slightly sweet balsamic vinaigrette really brings everything together. So delicious! Preheat oven to 400°F. 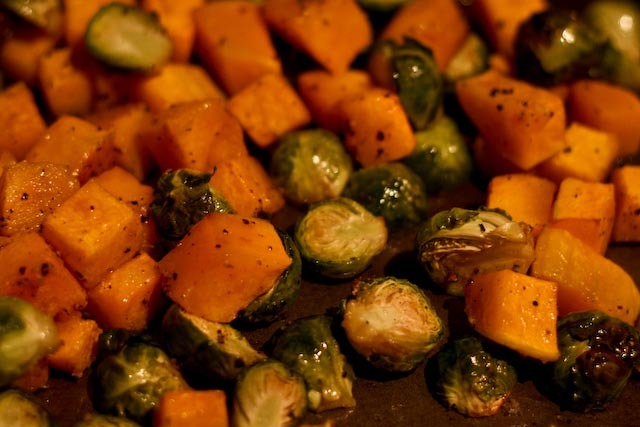 Spread Brussels sprouts and butternut squash on a baking sheet. Drizzle with olive oil and season with salt and pepper. 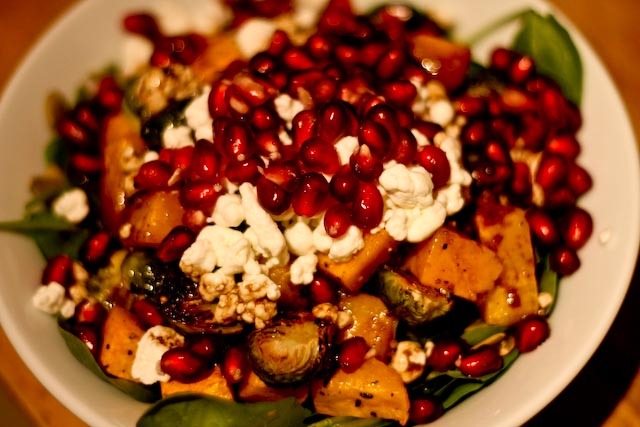 Using your hands, toss the squash and sprouts to cover well with oil and seasoning. Bake for approximately 20 minutes, or until the squash and Brussels sprouts are just tender. Let cool for a few minutes. To make the vinaigrette, whisk balsamic vinegar, salt, pepper, Dijon mustard, and honey. While whisking, slowly add in the olive oil until the dressing is well mixed. 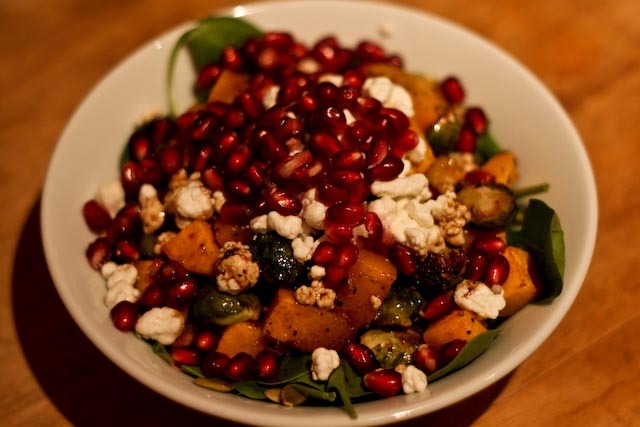 Divide the spinach, butternut squash, Brussels sprouts, goat cheese, and pomegranate seeds between two bowls. Drizzle evenly with vinaigrette just before serving. This looks AMAZING. Can’t wait to try it!